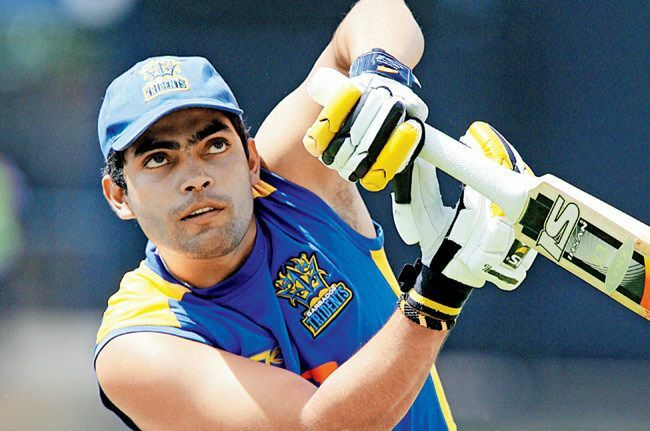 Umar Akmal (Urdu: عمر اکمل‎; born 26 May 1990) is a Pakistani cricketer. He made his ODI debut on 1 August 2009 against Sri Lanka and made his Test debut against New Zealand on 23 November 2009. He is a right-handed batsman and a part-time spinner. Like his two brothers, Adnan and Kamran, Umar has kept wicket for the national team any many ODIs. His wife name is noor Fatima. He was announced as a Franchise Player for the inaugural Caribbean Premier League alongside Pakistani teammates Mohammad Hafeez and Shoaib Malik Domestically, he played for Sui Northern Gas Pipelines Limited for eleven years, before signing with United Bank Limited in August 2017. In the second innings he was moved down the order to his usual batting spot of number 5 as captain Mohammed Yousuf chose to bat at number 3 himself, and Akmal looked his usual aggressive self throughout his innings of 52 which came off only 33 balls. In an interview, Umar said "My own dream is to one day play for Pakistan alongside Kamran Bhai (Brother) and I'm working hard to try and achieve that goal". Akmal was selected in Pakistan's squad for the One Day International Series against Sri Lanka in July/August 2009. In February 2012 Pakistan faced England in four ODIs. Pakistan's brittle batting meant the team management chose to play Umar as a wicket-keeper based on his batting, though his brother Adnan was considered the better 'keeper. Umar Akmal has the record for scoring the most number of ducks in Twenty 20 cricket history(27). Umar remained highest runs scorer batsman in PSL 2016. He scored 335 runs in seven innings with four half-century. Umar is the youngest brother of Adnan Akmal and Kamran Akmal who are also cricketers, both wicket-keepers. While he was playing for the Barbados Tridents, in the Caribbean Premier League, he had to spend a night in hospital after he suffered mild seizures. Following this, the PCB called him back for a complete medical checkup and also dropped him from the upcoming Zimbabwe tour. On 6 September 2013 he was cleared by a neurologist, saying that the seizure was possibly due to a lack of sleep.